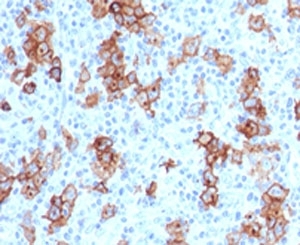 CD30 antibody LS-C391780 is an unconjugated mouse monoclonal antibody to human CD30. Validated for Flow and IHC. Ready-to-Use. Also available Unmodified or Azide-free. CD30 antibody was raised against recombinant human protein. The applications listed have been tested for the unmodified form of this product. Other forms have not been tested. CD30 is the receptor for TNFSF8/CD30L. May play a role in the regulation of cellular growth and transformation of activated lymphoblasts. Regulates gene expression through activation of NF-kappa-B. [UniProt] Optimal dilution of the CD30 antibody should be determined by the researcher. Staining of formalin-fixed tissues requires boiling tissue sections in 10mM Tris with 1mM EDTA, pH 9.0, for 10-20 min followed by cooling at RT for 20 min. 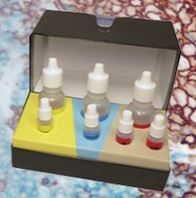 The prediluted format is supplied in a dropper bottle and is optimized for use in IHC. After epitope retrieval step (if required), drip mAb solution onto the tissue section and incubate at RT for 30 min. IHC testing of FFPE human Hodgkin's lymphoma and CD30 antibody (CDLA30-1). This image was taken for the base form of this product. Alternate forms, such as conjugated, azide-free, or ready-to-use, have not been tested. This image was taken for the unmodified form of this product. Other forms have not been tested.